I was first introduced to this recipe for taco soup by a lovely friend who brought it over after I’d had my first kiddo. She delivered it, still warm, in a giant Tupperware container. It was accompanied by a pan of fresh cornbread, pico di gallo from our local grocery deli and a few perfectly ripe avocados. 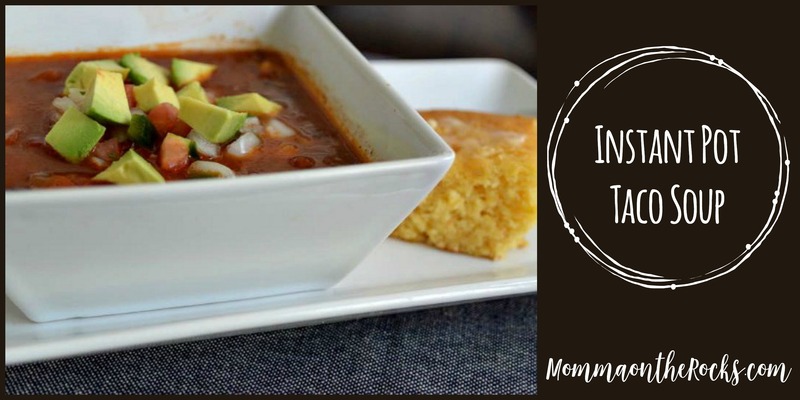 It was heaven in a paper bag to this new mom, and every since, this taco soup is my go-to for Sunday football watching, fast meals for us, for bringing to new moms or for those in need of a meal during a tough time – it’s wonderful comfort food. I confess – this is very much a “dump” soup, and to quote my friend Irene “it’s not haute cuisine, but it sure is good!” I’m normally not one for using packaged mixes – I prefer to mix up my own taco seasoning because I can adjust the heat (The Pioneer Woman’s recipe is my go-to), but sometimes you just need an easy meal, and for those occasions I feel no guilt grabbing a low-sodium package of taco seasoning. It comes together fast and you can keep it warm in the IP with no worries. Let’s make some Taco Soup! Y’all know how to brown ground beef and onions and open cans, so I’m going to skip all the step-by-step on this recipe. Brown 1-1/2 pounds of lean ground beef and one chopped onion. You can do this directly in your instant pot, but I prefer a large skillet because it’s faster and easier to drain. Don’t drain any cans except for the hominy. That’s right – just open them up and add them in. Except for the can of hominy – you want to drain it first, then add it. Then add the packages of Ranch dressing mix and taco seasoning and stir well. Add enough water to make you think “soup” or “chili” and not “stew”. You don’t want it too thick – but I find that the liquid volume depends on the tomatoes. Give it one more stir and close the lid. Set your instant pot for the “SOUP” setting – mine ran 20 minutes. Allow it to natural release as that pot will be VERY full. Open the lid carefully. Give it a final stir, and serve it up. Top it off your taco soup with some freshly diced avocado and a spoonful or two of pico de gallo. The crunch of the raw onion and jalapeño. You can even give it a squeeze of lime or a sprinkle of shredded cheese if that’s your thing. Just add a warm, buttery square of cornbread (or some wedges of cheese quesadilla) and a fresh green salad to round out the meal. We love this recipe for taco soup. What would you serve with it? Give me a shout out in the comments, and let me know if you try it yourself! Pico de gallo, for topping. Brown onions and ground beef together in a skillet, then drain. (You CAN brown them in your Instant Pot, but be aware this will take longer. I'll wash one pan while the soup is cooking in the interest of speed). Add the browned beef and onions to the Instant Pot. Get your can opener ready! Add all of the canned beans and tomatoes, along with the green chilis, directly to the instant pot and do _not_ drain _them_! (however) Drain the hominy, then add it to the pot. Open the packages of ranch dressing mix and taco seasoning mix and add to the pot. Add water as needed to bring to a soup (not stew) consistency. I find this varies depending on the brand of tomatoes I use. Stir well to combine ingredients. Close the lid of the instant pot and check that vent position is set to "sealing". Press Soup setting on your instant pot - this should be about 20 min low pressure. Natural release (as the pot will be very full). Top with fresh diced avocados and a spoonful of pico de gallo! Serve with cornbread or corn muffins and a green salad! Looking for other recipes for your Instant Pot? Check out these favorites! Previous PostI Love the Perot Museum. Here’s what’s on for the 2018-2019 Season!